For other people named William King, see William King (disambiguation). Not to be confused with Rufus King. Sampson County, North Carolina, U.S.
William Rufus DeVane King (April 7, 1786 – April 18, 1853) was an American politician and diplomat. He was the 13th vice president of the United States for six weeks in 1853 before his death. Earlier he had been elected as a U.S. representative from North Carolina and a senator from Alabama. He also served as minister to France during the reign of King Louis Philippe I. A Democrat, he was a Unionist and his contemporaries considered him to be a moderate on the issues of sectionalism, slavery and westward expansion, which contributed to the American Civil War. He helped draft the Compromise of 1850. He is the only United States executive official to take the oath of office on foreign soil; he was inaugurated in Havana, Cuba, due to poor health. King died of tuberculosis after 45 days in office. With the exceptions of John Tyler and Andrew Johnson—both of whom succeeded to the presidency—he is the shortest-serving vice president. King was the only U.S. vice president from the state of Alabama and held the highest political office of any Alabamian in American history. He was the third vice president to die in office. King was born in Sampson County, North Carolina, to William King and Margaret deVane. His family was large, wealthy and well-connected. He graduated from the University of North Carolina at Chapel Hill in 1803, where he was also a member of the Philanthropic Society. Admitted to the bar in 1806 after reading the law with Judge William Duffy of Fayetteville, North Carolina, he began practice in Clinton. King was an ardent Freemason, and was a member of Fayetteville's Phoenix Lodge No. 8. King entered politics and was elected as a member of the North Carolina House of Commons, where he served from 1807 to 1809, and he became city solicitor of Wilmington, North Carolina, in 1810. He was elected to the Twelfth, Thirteenth and Fourteenth Congresses, serving from March 4, 1811, until November 4, 1816, when he resigned to become Secretary of the Legation for William Pinkney during Pinkney's appointment as Minister to Russia and special diplomatic mission in Naples. He was only 25 years old when he became a congressman for the first time. When he returned to the United States in 1818, King joined the westward migration of the cotton culture to the Deep South, purchasing property at what would later be known as "King's Bend" between present-day Selma and Cahaba on the Alabama River in Dallas County of the new Alabama Territory, which had been recently separated from Mississippi. He developed a large cotton plantation based on slave labor, calling the property "Chestnut Hill". King and his relatives formed one of the largest slaveholding families in the state, collectively owning as many as 500. William Rufus King was a delegate to the convention which organized the Alabama state government. 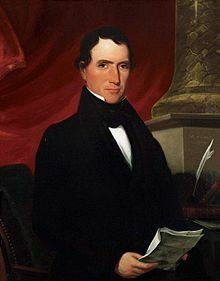 Upon the admission of Alabama as the twenty-second state in 1819 he was elected by the State Legislature as a Democratic-Republican to the United States Senate. King was a follower of Andrew Jackson, and was reelected to the Senate as a Jacksonian in 1822, 1828, 1834, and 1841, serving from December 14, 1819, until his resignation on April 15, 1844. During this time, in March–April 1824, William R. King was honored with a single vote at the Democratic-Republican Party Caucus to be the party's candidate for the Office of U.S. Vice President for the upcoming 1824 presidential election. Later he served as President pro tempore of the United States Senate during the 24th through 27th Congresses. King was Chairman of the Senate's Committee on Public Lands and the Committee on Commerce. He was appointed as Minister to France, and served from 1844 to 1846. After his return, King resumed serving in the Senate, appointed and subsequently elected to fill the vacancy caused by the resignation of Arthur P. Bagby. He held his seat from July 1, 1848, until resigning because of ill health on December 20, 1852, after having been elected vice president. During the conflicts leading up to the Compromise of 1850, King supported the Senate's gag rule against debate on antislavery petitions and opposed proposals to abolish slavery in the District of Columbia, which was administered by Congress. King supported a conservative, pro-slavery position, arguing that the Constitution protected the institution of slavery in both the Southern states and the federal territories. He opposed both the abolitionists' efforts to abolish slavery in the territories as well as the "Fire-Eaters" calls for Southern secession. On July 11, 1850, two days after the death of President Zachary Taylor, King was appointed Senate President pro tempore. Because Millard Fillmore ascended to the presidency, the vice presidency was vacant, making King first in the line of succession under the law then in effect. He also served as Chairman of the Senate's Committee on Foreign Relations and the Committee on Pensions. James Buchanan, (1791–1868), 15th President of the United States (served 1857–1861). He shared a Washington boardinghouse with his friend and colleague, William R. King. The argument for King's homosexuality has been put forward by biographer Jean Baker, supported by Shelley Ross, James W. Loewen, and Robert P. Watson, and focuses essentially on his close and intimate relationship with President James Buchanan. The two men lived together for 13 years from 1840 until King's death in 1853. Buchanan referred to the relationship as a "communion", and the two often attended official functions together. Contemporaries also noted and commented upon the unusual closeness. Andrew Jackson mockingly called them "Miss Nancy" and "Aunt Fancy" (the former being a 19th-century euphemism for an effeminate man), while Aaron V. Brown referred to King as Buchanan's "better half". However, Lewis Saum, has argued that "…Customs and expressions were different in the mid-1800s than they are today... "Miss Nancy" was "a fairly common designation for people who wore clean clothes and had good manners"; and noted that Aaron Brown was a political enemy of King. James Loewen has described Buchanan and King as "siamese twins". A biographer of James Knox Polk, Barzman wrote that "King's "fastidious habits and conspicuous intimacy with the bachelor Buchanan gave rise to some cruel jibes." Buchanan adopted King's mannerisms and romanticised view of southern culture. Both had strong political ambitions and in 1844 they planned to run as president and vice president. Both men were soft, effeminate and eccentric. They spent some time apart while King was on overseas missions in France, and their letters remain cryptic, avoiding revealing any personal feelings at all. In May 1844, Buchanan wrote to Cornelia Roosevelt, "I am now 'solitary and alone,' having no companion in the house with me. I have gone a wooing to several gentlemen, but have not succeeded with any one of them. I feel that it is not good for man to be alone, and [I] should not be astonished to find myself married to some old maid who can nurse me when I am sick, provide good dinners for me when I am well, and not expect from me any very ardent or romantic affection." After King died in 1853 Buchanan described him as "among the best, the purest and most consistent public men I have known." Baker concluded that while some of their correspondence were destroyed by family members, the length and intimacy of surviving letters illustrate "the affection of a special friendship" between King and Buchanan, with no way to know for certain whether it was a romantic relationship. The 1852 Democratic National Convention was held at the 1851 Maryland Institute for the Promotion of the Mechanic Arts Hall in Baltimore. Franklin Pierce was nominated for president, and King was nominated for vice president. Pierce and King defeated the Whig candidates, Winfield Scott and William Alexander Graham. (While attending college, King and Graham had been members of rival campus organizations in Chapel Hill; King belonging to the Philanthropic Society and Graham to the Dialectic Society.) Because King was ill with tuberculosis and had traveled to Cuba in an effort to regain his health, he was not able to be in Washington to take his oath of office on March 4, 1853. By a Special Act of Congress, he was allowed to take the oath outside the United States, and was sworn in on March 24, 1853, near Matanzas, Cuba. Shortly afterward, King returned to Chestnut Hill, where he died within two days. He was interred in a vault on the plantation and later reburied in Selma's Old Live Oak Cemetery. King never carried out any duties of the office. The U.S. Senate displays a bust of King in its collection, even though he never presided over a legislative session as vice president. Following King's death, the office of vice president was vacant until John C. Breckinridge was inaugurated with President James Buchanan in March 1857. Engraving of Chestnut Hill, published following King's death in the Illustrated News, New York, April 30, 1853. The house was destroyed by fire during the 1920s. Crypt of William R. King in Live Oak Cemetery, Selma, Alabama. In 1852, the Oregon Territorial Legislature named King County for him. King County became part of Washington Territory when it was created the following year. The King County government later amended its designation and its logo to honor instead the late national Civil Rights Movement leader, Martin Luther King Jr., (1929–1968). The King Residence Quadrangle at the University of North Carolina at Chapel Hill, his alma mater, is named for him. An 1830 portrait of King is held at New East Hall in the Philanthropic Chambers by the Dialectic and Philanthropic Societies, a debating society which he had joined during college. King was a co-founder of (and named) Selma, a town on the Alabama River which he named after the Ossianic poem "The Songs of Selma". After his death, city officials and some of King's family wanted to move his body to Selma. Other family members wanted his body to remain at "Chestnut Hill". In 1882, the Selma City Council appointed a committee to select a new plot for King's body. His remains were then reinterred in the city's Live Oak Cemetery under a white marble mausoleum erected by the city. ^ King was inaugurated—in Havana, in the Spanish colony of Cuba—twenty days after his term began (March 4) due to poor health. He was the first and only vice president to be sworn in on foreign soil. ^ a b Daniel Fate Brooks (2003). "The Faces of William R. King" (PDF). Alabama Heritage. University of Alabama, University of Alabama at Birmingham, Alabama Department of Archives and History. 69 (Summer): 14–23. Retrieved 2013-05-03. ^ a b c "U.S. Senate: William Rufus King, 13th Vice President (1853)". www.senate.gov. ^ Baker (2004), p. 75. ^ Benson Lossing, ed. (1907). Harper's Encyclopedia of United States History. Harper & Brothers. p. 195. Retrieved July 15, 2013. ^ "Vice Presidential Inaugurations". Architect of the Capitol. Retrieved July 15, 2013. ^ Bennett, Jim (April 2014). "Alabamians With National Aspirations". JCHA Newsletter. Birmingham, Alabama: Jefferson County Historical Association. Retrieved June 1, 2018. ^ Wilson, Scott. Resting Places: The Burial Sites of More Than 14,000 Famous Persons, 3d ed. : 2 (Kindle Locations 25688-25689). McFarland & Company, Inc., Publishers. Kindle Edition. ^ "Busts of Vice Presidents of the United States". Architect of the Capitol. Retrieved June 24, 2013. ^ "Motion No. 6461". King County, WA. Retrieved 29 May 2018. ^ "State law changed to rename King County". King County, Washington. Retrieved 11 December 2013. ^ Jaffee, Al (1979). The Ghoulish Book of Weird Records. Signet. pp. 136–140. ISBN 0-451-08614-7. United States Congress. "William R. King (id: K000217)". Biographical Directory of the United States Congress. Who is William Rufus King? This page was last edited on 28 March 2019, at 08:36 (UTC).